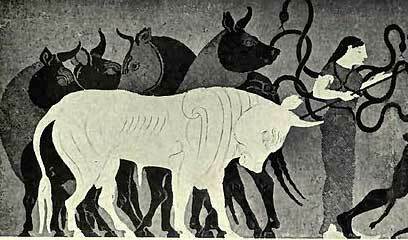 Heracles and the Cattles of Geryon, Cdm Paris.Blackfigured amphora. New York University’s Center for Ancient Studies announces the forthcoming Rose-Marie Lewent Conference, “Animals in Antiquity,” to be held Thursday, February 13 and Friday, February 14 at NYU’s Hemmerdinger Hall, Silver Center for Arts and Science. The conference, co-sponsored by the NYU Center for Ancient Studies, the Animal Studies Initiative, and the Department of Classics, will examine the role of animals in ancient culture, literature, and art. The full program may be viewed here.